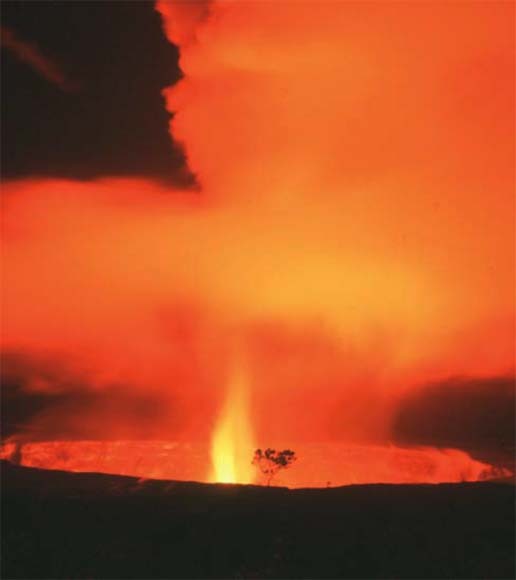 Photograph showing night view (time exposure) of Halemaumau Crater, taken about 1967-68. This report consists of a large map sheet and a pamphlet. 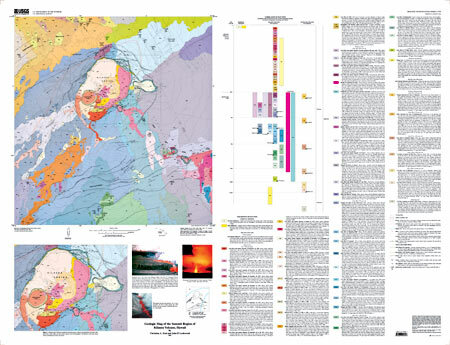 The map shows the geology, some photographs, description of map units, and correlation of map units. The pamphlet gives the full text about the geologic map. The area covered by this map includes parts of four U.S. Geological Survey 7.5' topographic quadrangles (Kilauea Crater, Volcano, Kau Desert, and Makaopuhi). It encompasses the summit, upper rift zones, and Koae Fault System of Kilauea Volcano and a part of the adjacent, southeast flank of Mauna Loa Volcano. The map is dominated by products of eruptions from Kilauea Volcano, the southernmost of the five volcanoes on the Island of Hawaii and one of the world's most active volcanoes. At its summit (1,243 m) is Kilauea Crater, a 3 km-by-5 km collapse caldera that formed, possibly over several centuries, between about 200 and 500 years ago. Radiating away from the summit caldera are two linear zones of intrusion and eruption, the east and the southwest rift zones. Repeated subaerial eruptions from the summit and rift zones have built a gently sloping, elongate shield volcano covering approximately 1,500 km2. Much of the volcano lies under water; the east rift zone extends 110 km from the summit to a depth of more than 5,000 m below sea level; whereas the southwest rift zone has a more limited submarine continuation. South of the summit caldera, mostly north-facing normal faults and open fractures of the Koae Fault System extend between the two rift zones. The Koae Fault System is interpreted as a tear-away structure that accommodates southward movement of Kilauea's flank in response to distension of the volcano perpendicular to the rift zones.